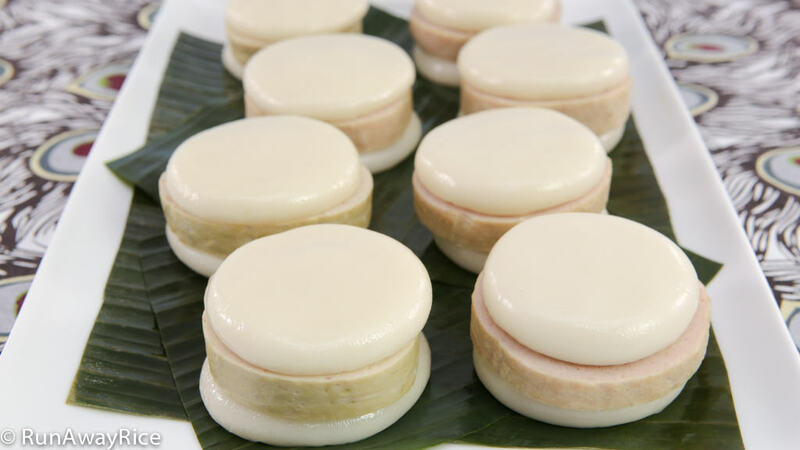 With this easy recipe, you can make Steamed Rice Cakes and Pork Roll (Banh Day / Giay), thick-sliced pork roll layered between two steamed glutinous rice cakes, in no time at all. Call it a Vietnamese sandwich, the Steamed Rice Cakes and Pork Roll (Banh Day / Giay) are tasty treats and full of flavor and fun texture. 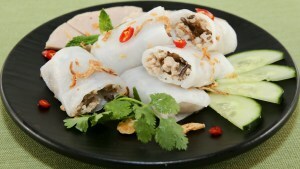 Glutinous rice flour is what gives these delicious cakes the uniquely sticky and chewy texture. 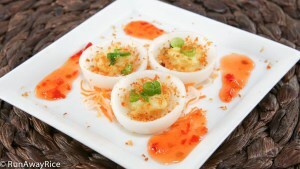 The ingredients are simple and the recipe is straightforward, so no excuses for not giving this recipe a try. Make a batch for your family today. These sandwiches are great for lunch boxes or as small bites for in between meals. Delish! The banana leaves add a wonderful aroma, but if you need a shortcut, use parchment paper. This dough is really forgiving. Any time before steaming, if the dough is too dry or too wet, adjust by adding more water or glutinous rice flour and then mixing together. It’s better for the dough to be a bit on the drier side than too wet. If you need to add more water, add 1 Tbsp at a time, mix and then check the consistency. 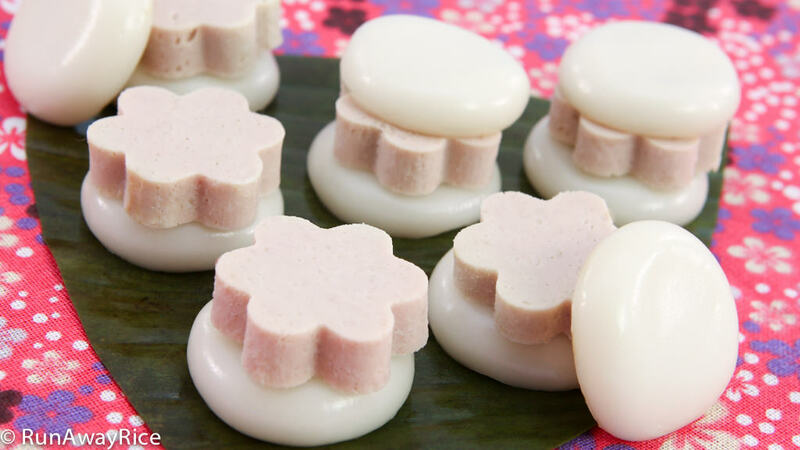 This recipe yields 8 Steamed Rice Cakes and Pork Roll (Banh Day / Giay) sandwiches. Each cake is about 2 ounces of dough. Use more dough if you’d like the cakes a bit thicker. Wrap the lid with a kitchen towel to prevent the moisture from dripping onto the cakes and causing blisters. Do not steam these cakes with vigorously boiling water. The cakes will ooze and become flat. Steam gently and be sure to remove the lid twice to release the steam. The cakes are done when they turn from a white color to opaque. 2 lbs of of steamed pork roll is generous and you may not use it all depending on how meaty you like your sandwiches. Take one of the banana leaves and fold in half and then in half again making a small square. Use a 3″ round cookie cutter to score the leaf. Cut out the circles using scissors. Repeat the steps with the remaining leaves making a total of 16 circles. Place the water into the microwave and cook on High for 1 minute and 30 seconds. In a mixing bowl, add the glutinous rice flour, rice flour, salt and vegetable oil. Mix on Low speed for 10 seconds. Gradually pour in the hot water while mixing on Low speed. After a minute or so the dough should start to form. Continue mixing for another minute or until all of the dry ingredients are incorporated. Scrape off the dough from the flat beater. Continue mixing for another 2 minutes. Knead the dough for 30 seconds working in any remaining dry ingredients. Pat the dough into a rough ball and transfer to a bowl. Cover with plastic wrap and let rest for 30 minutes. Using a pastry brush, coat the dark green, shiny side of the banana leaf circles with vegetable oil. Divide the dough into 16 equal-sized balls. Take one of the dough balls and gently squeeze a few times to compress the dough. Roll between your palms shaping into a smooth ball. Place the ball on the banana leaf and gently press down flattening the dough, leaving about 1/4-inch of the banana leaf showing. Continue until all cakes are made. Place 8 cakes into the steamer tray. Fill 1/3 of the steamer basin with water. Cover and bring to a boil over High heat. Reduce the heat to Medium Low. Add the steamer tray and lid and steam for 3 minutes. Remove the lid to release the steam and then cover again. Steam for another 3 minutes. Again, remove the lid to let out some steam and cover. Steam for another 4 minutes. Transfer the cakes to a wire rack and allow to cool. Repeat the above steps to steam the second batch. Slice the steamed pork roll into thick slices. 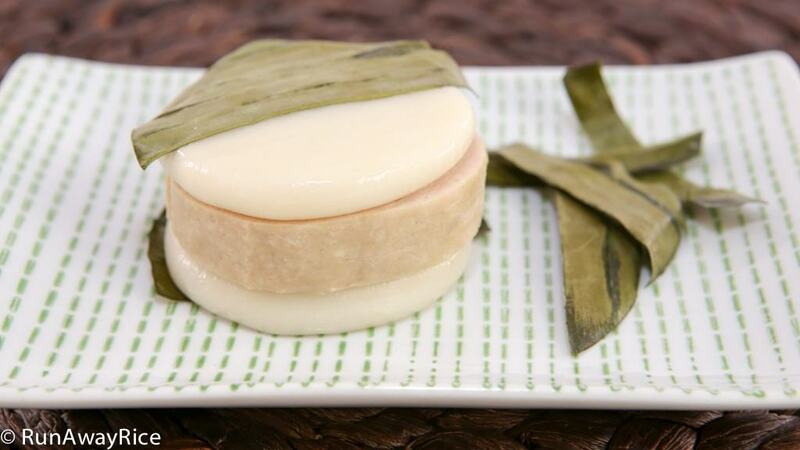 To assemble, place a rice cake on a plate (with the banana leaf touching the plate). Add a slice of the steamed pork roll. Add another rice cake on top (with the banana leaf facing up) making a sandwich. Peel off small sections of the banana leaves and discard as you eat the cake. The leaves keep the cakes from sticking to your fingers. Enjoy! Store any remaining cakes in refrigerator and consume within the week. These cakes can be frozen for up to two months. To reheat, microwave on Low until warm or allow to defrost at room temperature. Need a refresher on how to clean banana leaves? 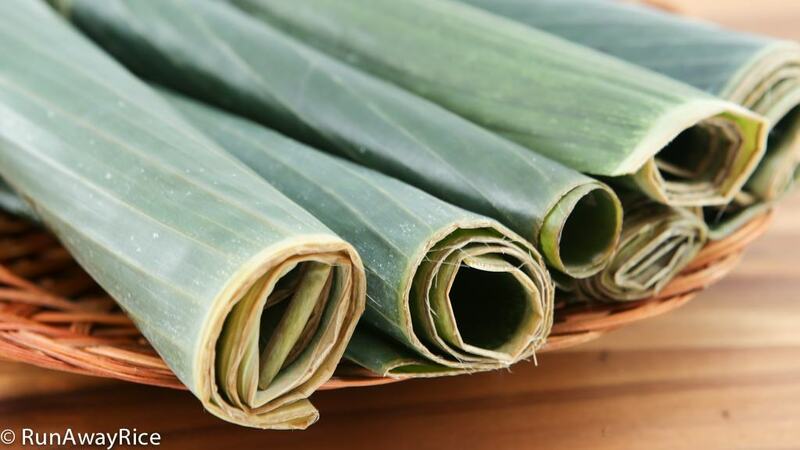 Check out this post for How to Prepare Banana Leaves. I made banh day yesterday. I didn’t even use the mixer, just kneaded by hand. So soft and chewy at the same time. Amazing and yummy. Really love your receipt and the way you give instructions! I would like to know how is the hot water temperature, in case I don’t use microwave? The hot water is 120 degrees F. Enjoy the recipe! Tks a lot for replying me. Have a nice day ;)!